One dilemma facing any biographer of Dr. Robert Walter Johnson would be: Where do you begin to tell the story? How do you begin to describe the swirling, unstoppable brilliance and energy of a man appropriately nicknamed “Whirlwind”? You could start with how he got that nickname, on the football field at Lincoln, a small black university near Oxford, Pennsylvania. But his college football career is only a part of the story. It is also the story of bridging the racial divide in the world of tennis, starting with one clay court on Pierce Street in Lynchburg, Virginia. 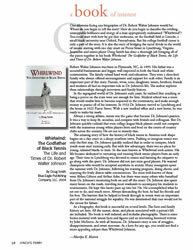 Journalist and tennis player Doug Smith has done a thorough job bringing all of the pieces together in his book Whirlwind: The Godfather of Black Tennis, the Life and Times of Dr. Robert Walter Johnson. Robert Walter Johnson was born in Plymouth, NC, in 1899. His father was a successful businessman and logger, well respected in both the black and white communities. The family valued hard work and education. They were a close-knit family who always offered encouragement and support for each other. Family is an important part of this story. Parents, wives, sons, daughters, sisters, brothers, friends and students all had an important role in Dr. Johnson’s life. The author explores these relationships through interviews and family history. In the segregated world of Dr. Johnson’s early years, he realized that coaching or being a porter on the train were not enough for him. Medical school was a route that would enable him to become respected in the community, and make enough money to pursue all of his interests. In 1933 Dr. Johnson moved to Lynchburg and the house at 1022 Pierce Street. With a new medical office and a new home, he was ready to make his mark. Always a strong athlete, tennis was the game that became Dr. Johnson’s passion. It was a way to keep fit, socialize, and compete with friends and colleagues. But Dr. Johnson quickly realized that even college league black players could not compete with the numerous young white players born and bred on the courts of country clubs across the country. He set out to remedy that. The amazing story of how the history of black tennis in America took shape begins on a clay court in a sleepy southern town. Pushing to integrate tennis was only the first step. Dr. Johnson quickly realized that in order to compete, black youth must start training early. But with few advantages, there was no place for young, talented blacks to train. So the man known as Whirlwind took action. His life became dedicated to recruiting and training black tennis players from an early age. Their time in Lynchburg was devoted to tennis and learning the etiquette to go along with the sport. Dr. Johnson did not just train good players. He wanted champions who would be accepted anywhere in society. Many youngsters spent the summer with Dr. Johnson, following his training program, doing chores, and enjoying the lively dinner-table conversations. The most well-known of these were Althea Gibson and Arthur Ashe, but there were many others who benefited from Dr. Johnson’s mentoring both on and off the court. Dr. Johnson also spent many hours on the roads, traveling most weekends to accompany his students to tournaments. He kept this hectic pace up into his 70s. He accomplished what he set out to do, and much more. Always demanding the best, he had his friends and his foes. The barriers that he helped to break through in tennis were an important part of the national struggle for equality. He was determined that race would not be the excuse for failure. As a biography, this book is successful on several levels. The facts and family history are here. All the names, dates, and places associated with a person’s life are included. The book is well indexed, and includes photographs. There is some bonus material with tennis facts and figures and an interesting foreword written by John McEnroe. As with all humans, Dr. Johnson’s story is one of struggles, disappointments, and sweet successes. As a hero for any age, you could not find a more appealing subject than Whirlwind Johnson.